In addition, a significant portion of the book addresses Agile Chartering. In fact, Diana and Ainsley debated writing a book exclusively on this topic as they deem it so critical to the success of Agile projects. Instead, they have integrated a chartering discussion and charting model into their Liftoff framework. Their decision makes for a better book, in my opinion. While there are a lot of good examples, checklists, and stories, Diana and Ainsley emphasize the values and principles behind the ample practical advice they give throughout the book. In this vein, they stay true to the Agile principle expressed in the Agile Manifesto, "Individuals and interactions over processes and tools." Full disclosure: I’m a contributor to the book, so I may be a bit biased, but I think Diana and Ainsley’s contribution to the Agile canon will ultimately result in better agile projects and better business results. 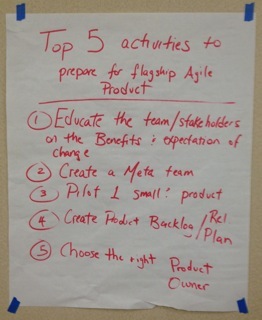 Anyone who is thinking about or getting ready to start an Agile project should check out Liftoff .